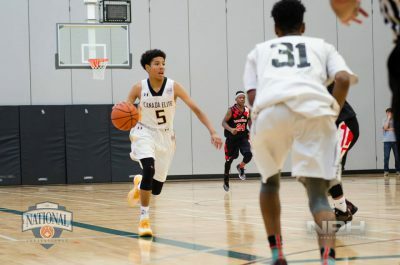 One of the big debates this past season in Canadian youth basketball circles was Addison Patterson or Cashius McNeilly as the top freshman (both are 2001-born) in the country. The discussion has been enough to build up a perceived rivalry between the two young prospects. Patterson, for his part, downplays any talk of an off-the-court rivalry, calling McNeilly “my bro”. 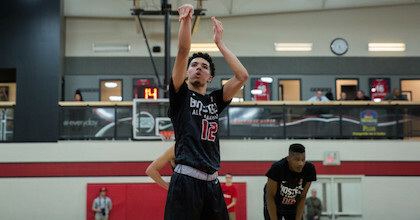 Both players impressed this season with Patterson more than holding his own at powerhouse Athlete’s Institute despite arriving after the start of the school year from Bishop Reding. McNeilly for his part excelled and dominated games at time for Thornlea. After the Ontario Scholastic Basketball Association (OSBA) season, both played at the BioSteel All-Canadian Futures Game and the Jordan Brand Classic Global Showcase – facing off against each other in both games. And both times Patterson got the better in both games with the victory in both and taking home the MVP trophy from both showcases. “It was a great week. I came in both games aggressive and just trying to win. It was important to keep my body ready to play a week straight,” Patterson said. It seemed a given that Patterson would actually team up with McNeilly this summer for the Canadian cadet team at the FIBA U16 Americas Championship 2017 in Formosa, Argentina. And Patterson said he was looking forward to the tournament from June 14-18. “I am very excited to play with this talented Canada team. We want to go down there and win it all,” Patterson said. As it turns out, neither Patterson nor Hemmings were included on the U16 team. Regardless, Patterson is part of another wave of high level talent from Canada. “It’s great. It’s a pride thing whenever we play, especially when we go down to the US. We have something to prove all the time. It’s fun going hard every time on the court,” Patterson said. Patterson picked up the game when was 8 years old and looked up to LeBron James because he was an all-around player. Patterson likes getting himself hyped up before games by listening to G Herbo and Chief Keef. He also named Snapchat as his favorite app. If you ask him about school, you might want to talk about his favorite subject math and avoid science – his worst subject in the classroom. Of course, this is a still a very young man we’re talking about a 16-year-old. Still, Patterson seems mature for his age in how he talks with you. But, there is still a kid in there no? Patterson is a NBA 2K fan and his team of choice is Portland. Hard to argue that. Just like it’s hard to argue he’s one of the hottest young prospects coming up through the ranks in Canada.